Lifestyle: The 1950’s was the age of ‘respectability and conformity’ for women, which was also known as being a ‘housewife’. Very few women worked after getting married. Again, like the other decades, if the woman found herself in a loveless or violent marriage, she was trapped; no money, no career. It was unusual for women to go to University. Women left school and went straight into work up until marriage. The man’s lifestyle would also be repetitive as they would go out to work and, was considered the ‘head’ of the house. This meant looking after the mortgage, legal documents and other financial matters. Moreover, people’s lifestyle’s were a little more efficient than the years before as fridges were more common although, freezer’s were unheard of. There were no Supermarket’s, there had to be individual visits to the local baker, butcher, and greengrocer. The gadgets that we use today were not available for either cooking or cleaning, it was still very minimalistic. Entertainment: The radio and the gramophone were used for entertainment. However, more people were acquiring televisions; these were sometimes rented. 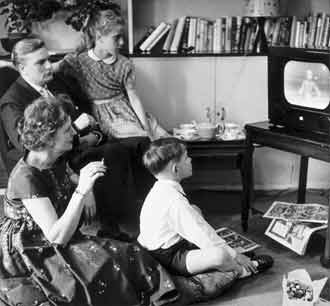 The cinema’s was still a form of entertainment, however, like now the television was encouraging families to stay home and watch TV together in the comfort of their own home. Families could enjoy programmes such as sitcoms, dramas, and sports. Children: Again, like the other decades, there were hardly any cars on the road; children could play within the streets and still be safe. Clothes were also often handmade for children. Children’s toys were popular, girls would play with their dolls tea sets whilst, boys would play with their train sets and arrow trucks. These items would be sold within stores, sometimes from as little as five shillings, which is 25p. Education was still important. However, some lessons for girls consisted of cookery classes, household management, sewing and even how to iron a shirt. This was a training programme on how to look after their future husband and children. To conclude, it seems as though time was evolving and this may be the reason why divorce rates had increased. However, after the war, lifestyle was back to normal and families were still very much close. Everything was still family orientated. Even though marriage rates decreased, they were still high; it was still a tradition to be a good housewife and a working husband. Both convenience and accessibility were still low therefore, lifestyle was still simple.